One of my biggest challenges in life is being on time. I'm the type that likes to do as much as I can, regardless of how little time I actually have. It's an ongoing feat to leave just 5 minutes to spare as a buffer for unexpected events. Welcome, the watch. Despite how many times I've tried to trick myself in setting my watch 5 minutes ahead, it always registers and comes back to haunt me. I hate to say that I've even told myself "ohh I still have 5 minutes to get there" when I look at the clock on my phone. BAD CALL. Fortunately, I've taken "fashionably late" to a new level, ensuring that my timepieces are just as fashionable as my tardiness. I started the hunt for a menswear inspired watch around 4 years ago, when the androgynous vibe was going mainstream. Around two years ago I added a gold one to my repertoire, followed by a rose gold Skagen just a few months back. Read on to see how they compare. I was so impressed by Fossil's incredibly lightweight "Stella" collection , featuring aluminum bracelets. While still maintaining the high-quality look and shine of stainless steel, I couldn't say no after finding my first big girl watch. The face is just over an inch in diameter, so it doesn't engulf my baby sized wrist. The watch was around $125 and still looks great after years of wear. They are able to remove links in-store and each watch comes with a 10-year warranty on the mechanical parts. This is the only watch I own which includes the date. 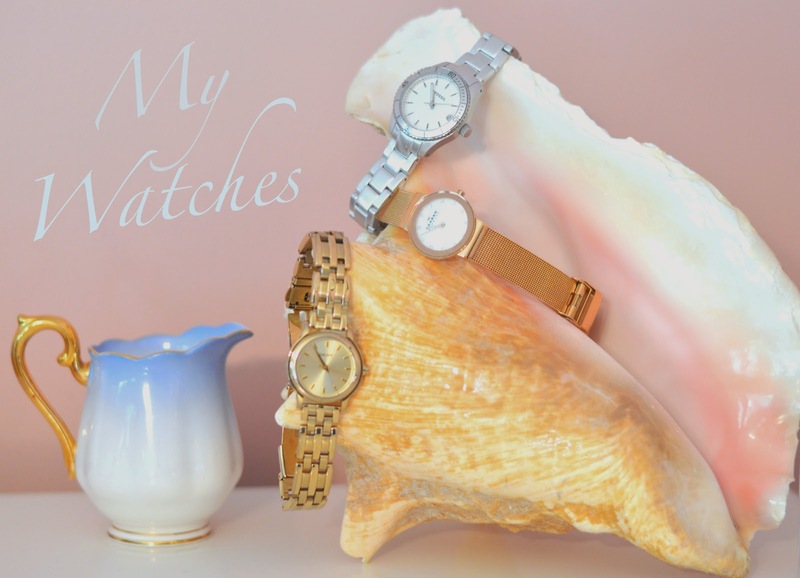 My gold DKNY watch was a bit of an impulse buy, after getting it into my head that I simply could not wear my bulky silver watch with dainty gold jewellery. I found it in-store at the Bay and happened to get $50 off during a promotion. I believe it was around $150 and included a 5-year warranty. I love how chic and minimalistic this watch is, and the best part is that the style is absolutely timeless (ha). And finally, my newest beauty. I fell in love with the incredibly thin and flat faces from Skagen after seeing one on a friend. I'm always impressed by Scandinavian style and was even more intrigued after noticing their rose gold options. This is my "going out" watch since it's fancy enough to pair with a cocktail dress. I'm definitely a fan of the mother of pearl face and simple crystal markers. I also really appreciate the adjustable mesh strap and how easy it is to fit it to the wrist. The watch has such an intricate clasp which sits very flat to the wrist just like the face. I managed to get this watch for around $100 from Macy's in Washington. In Canada, it would be considerably more expensive. Skagen also offers a limited lifetime warranty on their timepieces. I'm always roped in by watches, but can't see my collection growing much in the next few years. I have a few leather/silicone Swatch watches and a some vintage options that I don't reach for as often. I find that fun Swatch or Timex watches make such amazing gifts since they come in super fun styles at a very affordable price point. If you're in the market, make sure to look out for promotions and sales to avoid paying high price tags. Always strive to be on time lovelies!